I’ve always had a problem when it comes to packing underwear – I can’t get it to resemble anything other than a pile of mess. I didn’t realise I had a problem with packing underwear, I just thought that was the way it went because they’re smaller items and harder to keep organised and in its place. 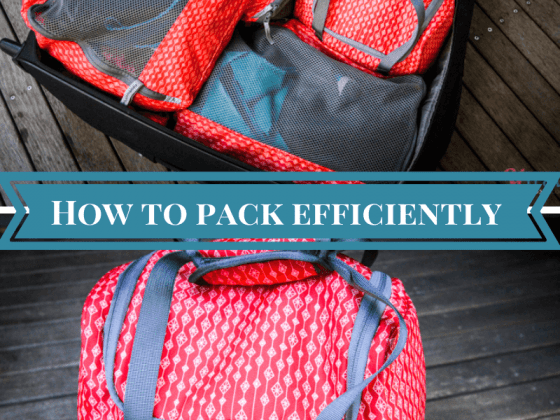 I use packing cells for luggage organization. They saved me from packing hell some time ago. I use them to organize my clothes and to pack my suitcase neatly. 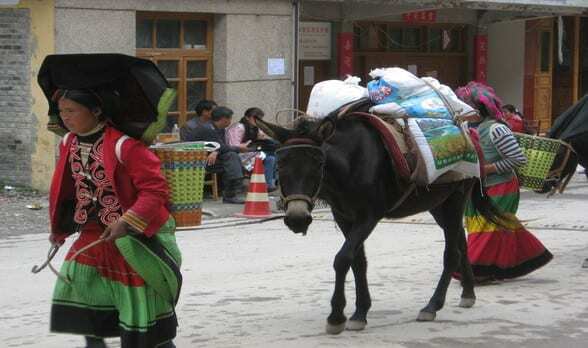 But, they still did not help me with packing underwear. I’d put them in the smallest packing cell I had, but still, it would be a jumbled up mess. Plastic bags would result in the same headache. So, I’d switch to packing my underwear, my bras, my socks and my jewelry in the top meshed zipped part of my suitcase. The bra straps would get caught on the mesh and I’d have to spend time unhooking them. The socks and undies would get swallowed up and it would drive me nuts. But, still, I thought that was just the way it was because underwear is small. The Origami Unicorn to be more exact, a simple underwear bag for packing underwear for your trip. 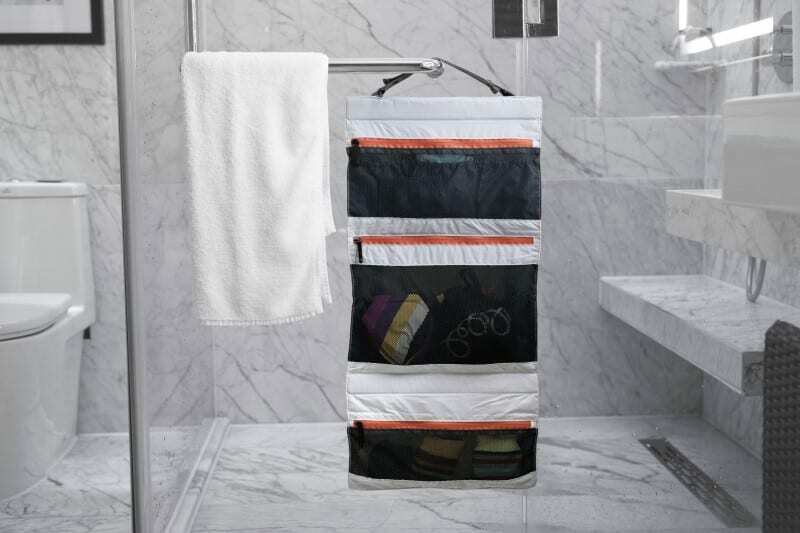 It’s an underwear organizer that can be used for any style of travel, whether it be a getaway, a week or two, or nomadic travel. You can even hang it up in your wardrobe at home and use it as a underwear organizer there! I do not travel without it now. When Origami Unicorn contacted me with a packing solution for packing my bras, underwear and small things in a neatly in a suitcase, I jumped on it! 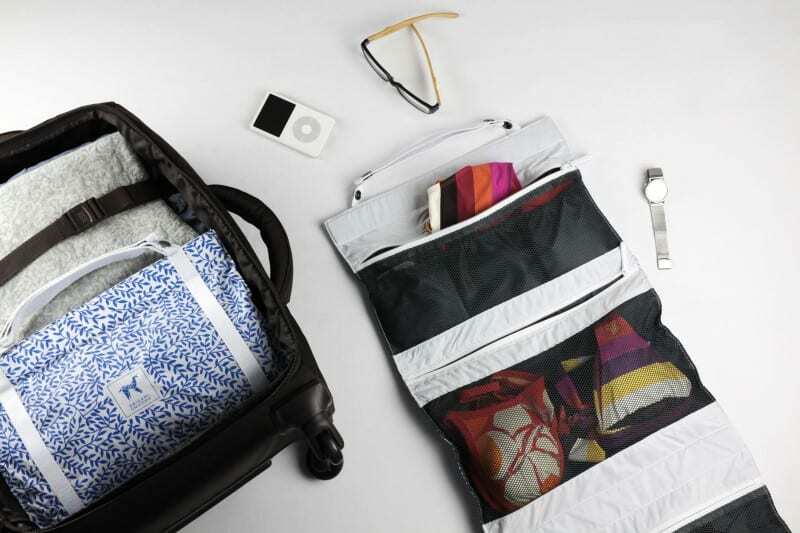 It’s called the ultimate travel undergarment organizer and it’s a simple underwear bag for traveling. Surprisingly, this underwear organizer is not something I’ve heard of before. I get emails every day with the latest and greatest travel products for me to try. I reject almost all of them. I don’t have the time and most of the stuff I don’t find so brilliant. I guess I found it useful. I love it. My travel underwear organizer has become my fafavoriteacking essential. I still use packing cells, but I think this takes underwear packing to a more efficient and enjoyable level. The Underwear Organizer rolls up and clips together like a little sleeping bag and sits in your suitcase neatly just like packing cells do. This means you can easily take it out when you arrive at your destination, unroll it and then hang it straight up in the wardrobe. No more hunting around in your suitcases, or packing cells, for those socks. Base they have their own little compartment in the bag. Yep. The Origami Unicorn is divided into three meshed zippered sections for your underwear organization. The top two sections have three small compartments that easily fit your underwear and socks. You can still put bras, underwear, swimwear or even jewellery into the zippered section. And the bottom section is one large zippered section without internal compartments. I usually throw swimmers or my gym gear in the bottom section. Wearing a red dress and want those lacy red undies? Pull them straight from their own compartment in a matter of seconds. You can easily see what you’re looking for and the mesh section is small enough that your bras won’t get hooked on them. It comes with a small laundry bag with a divider to separate socks and underwear. And they come in cute designs that are so discreet no one would know your undies are in them. No more undies lying on the airport conveyor belt when your bag bursts open. And no more red faces when the customs officer wants to search the inside of your bag. 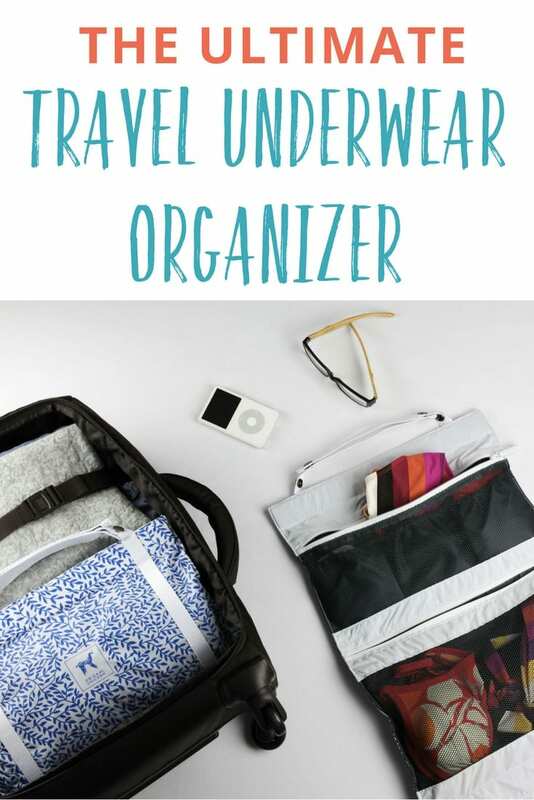 The underwear organizer can also easily fit into your day bag or if you want to pack just a few small items as a carry-on or when you’re out exploring. One thing I love love love about it is the ability to take it into the shower with you and hang it up away from the wet. I don’t know how many times my underwear got wet using the campground showers around Australia. You’d hang them up on the hook behind the door and then grab your towel on top of it, which would fling them on the puddles on the ground. No more wet undies or losing them on the way to the shower when they slip out of your grasp unnoticed! The Origami Unicorn underwear organizer works for women or men and can hold underwear for up to seven days. I love how someone has experienced all the underwear angst that I have but was clever enough to create a solution for it! 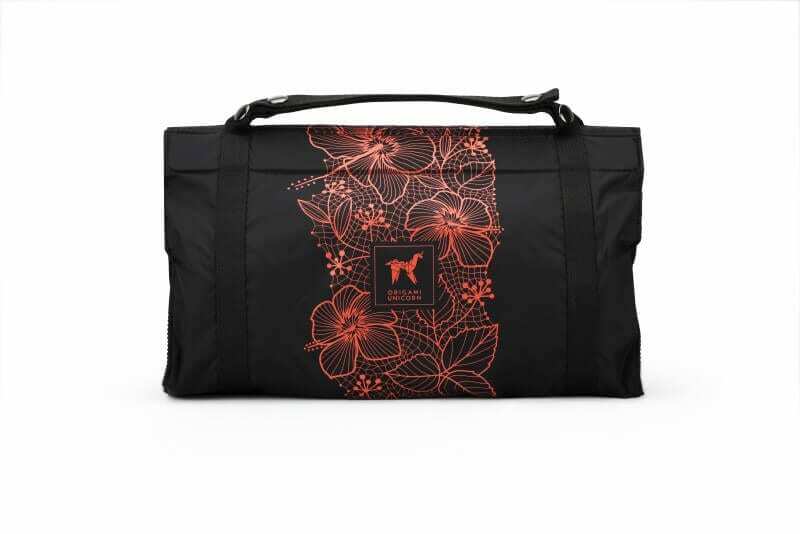 So far the Origami Unicorn undergarment organiser is my favourite travel product of the year. Click over now to get yourself this packing lifesaver. Don’t forget to get some for your loved ones for Christmas and birthdays! btw visit here if you are looking for some of the best travel gifts for travelers. Disclaimer: Unicorn sent me an underwear bag to try. I decided I liked them and found them awesome enough to share them with you. I also joined their affiliate program so will receive a small commission if you decide they’d be a great solution for your packing as well! wow this basic thing we would not consider in india. A very handy bag. It works well in narrow living spaces.